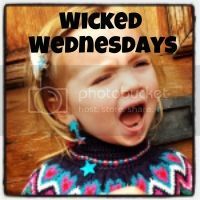 Hello and welcome back to this weeks Wicked Wednesdays! I hope you all enjoyed a nice and sober child friendly bank holiday? I did. Even managed to tuck into the odd vino on the evening which was super duper! Now I am going to get proper stern. PLEASE can we make sure that the photo you are popping up gives us a little insight into your real family life. So maybe a rubbish craft, a stroppy tot, a messy home. The reason the linky was started was to be a bit of an escape from the instagram life we all love so much! My favourites from last week were a hilarious spot story from Becoming A Stay at Home Mum, a beautiful family selfie from Mrs Puddleducky and a gorgeous snack from Mummy Ms Memories. You know the rules. Go forth link up and comment! PS VOTE FOR ME! (giving up being subtle). Was that your angry teacher voice?!?! Well, when you're hungry you've got to eat - and if the food is slow in coming then I guess daddy's ear is the next best thing! What's the obsession with the sneaky bite when there's meant to be a smile or cuddle. Aww it looks like he is giving daddy a lovely cuddle!